There is something magical about the island of Maui. But to pinpoint exactly what that magic is? Well, that’s pretty much an impossible task. Maybe it’s a state of mind, a feeling one experiences by being surrounded by the constant beauty of white sandy beaches, cascading waterfalls, tropical forests, colorful flowers and the omnipresent Haleakala, the world’s largest dormant volcano. If you’re a native like Tom Calhoun, and manage to enjoy life without much interaction with tourists, then Maui can be one step short of paradise. It is the “other” Hawaii, the true Hawaii that tourists rarely encounter or experience. Maui is the second-largest of the Hawaiian Islands and is slightly less than half the size of Rhode Island. The small island has a population of about 140,000, but it has more than two million visitors a year. Its major industries are tourism, sugar, pineapples, cattle and other forms of agriculture. And that’s why Calhoun is an anomaly. 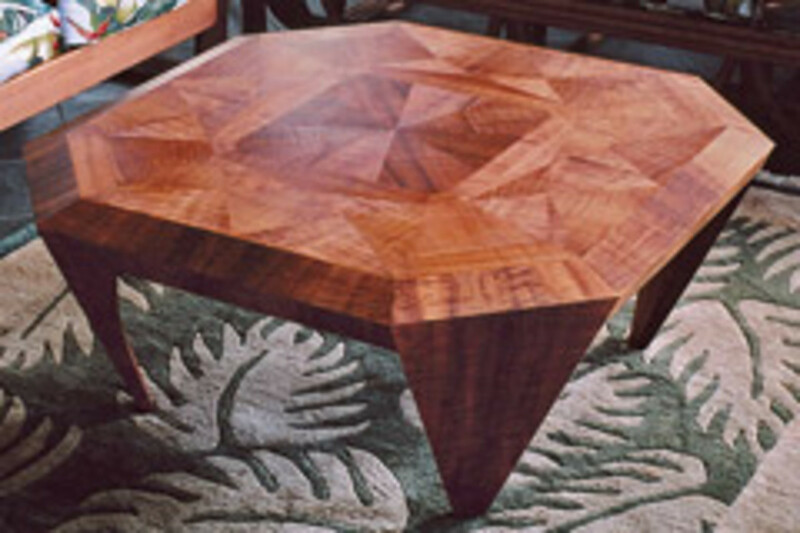 He is one of less than a dozen custom furniture makers on Maui and apparently the only native Hawaiian among the group. 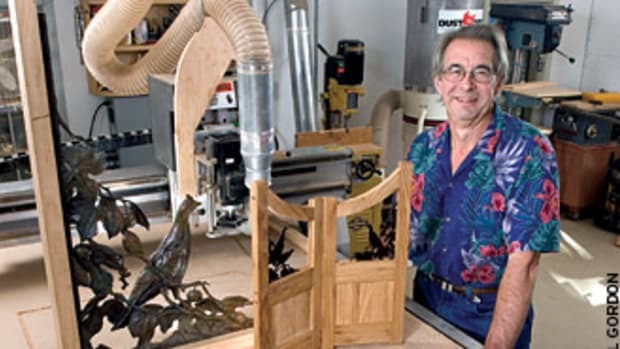 Calhoun is unusual in many ways — from his quiet demeanor, humility, appreciation of his surroundings and deep understanding of the Hawaiian culture, to his superior woodworking design and building abilities. 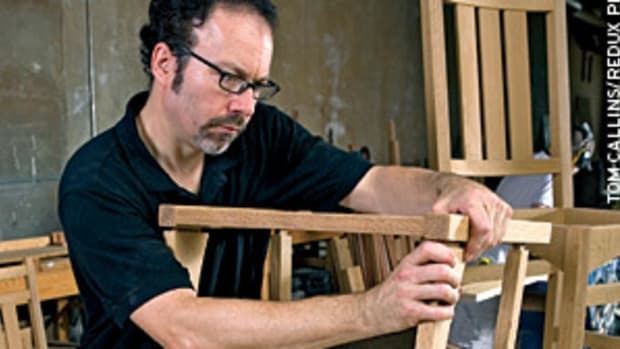 It all adds up to form an insightful, philosophical and talented custom furniture maker. Calhoun was born in Oahu and had little artistic training throughout his school years except for a brief stint in a cabinet shop. After receiving a low number in the draft lottery, he joined the Navy to study electronics. However, he was placed in the field of hydraulics and spent the next six years traveling the Pacific and West Coast. When he returned to civilian life, he moved to Maui and took a job in what he knew best — hydraulics. Approaching his mid-30s, Calhoun was faced with a premature midlife crisis, although it is hard to imagine such a quiet guy being in a crisis mode. It was more of a time for reflection as he looked toward the future. 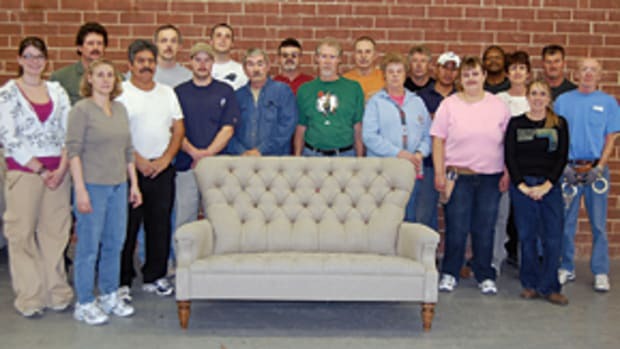 He worked in a small “semi-custom” furniture shop for about a year before deciding to work alone. Calhoun had a small inheritance that he sunk into equipment. When he looks back, he is amazed he was able to drum up any business. He was relatively unknown and didn’t possess much of a woodworking portfolio. But somehow he managed to receive enough orders to keep his head above water. Considering the gamble he took, Calhoun acknowledges that he was very fortunate in terms of the outcome. 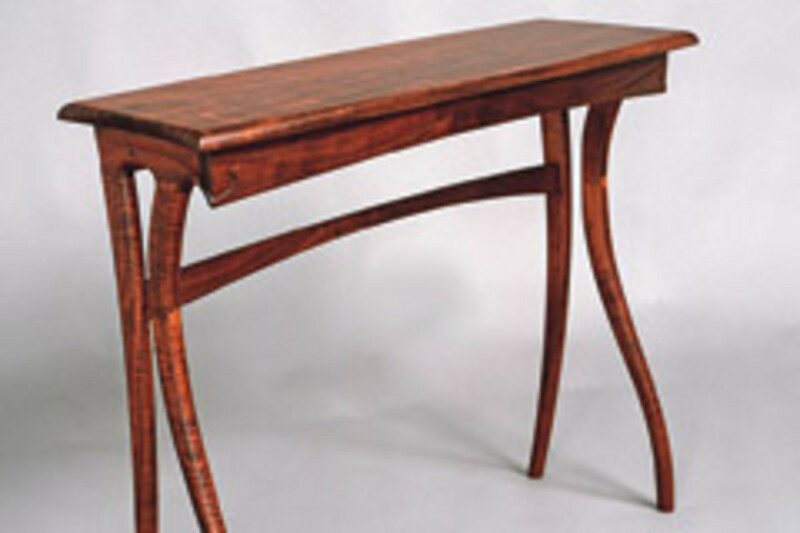 Maui is home to some very wealthy people, many of whom own several homes and want to furnish them with fine artistic objects, often with the “Hawaiian look.” Calhoun’s pieces often evoke a story and it is important to the furniture maker that his clients understand that. Again, Maui is home to some very wealthy people, owners of what’s known as “mega-mansions.” For the custom woodworker, that’s where the big paying jobs are. But obtaining them is not all that easy. Since that is the way things work on Maui, Calhoun has working relationships with designers, interior decorators and contractors. The majority of his work is through word of mouth, but he has had varying success with galleries. Some years, his gallery work has accounted for 20 percent of his sales, other years it has been as high as 90 percent. That unpredictability makes it tough for Calhoun, because gallery pieces are all built on spec. 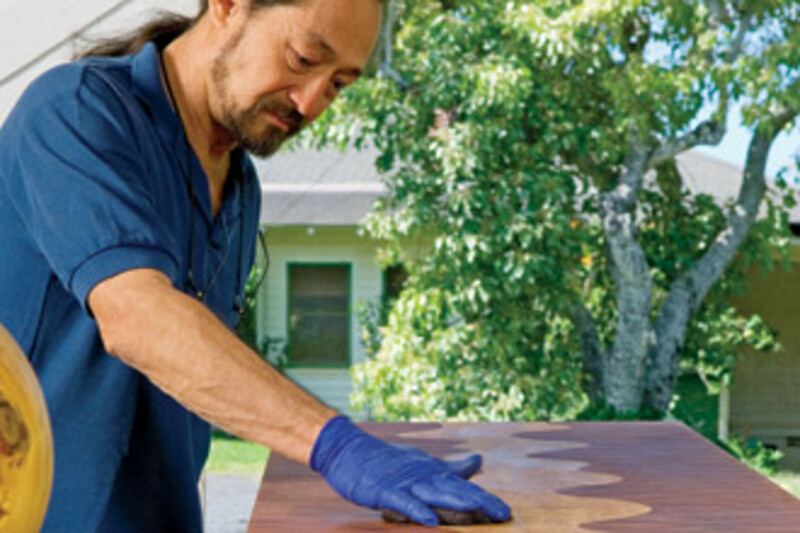 It’s impossible to write a profile of a Hawaiian woodworker without mentioning koa. Although there are other endemic species, koa is the most recognized on the mainland. Contrary to common perception, koa is plentiful on some of the Hawaiian Islands, and the best koa grows on the Big Island between 2,000 and 4,000 feet of elevation. It is the second-most common forest tree in Hawaii and is in no danger of extinction, according to Calhoun. But at the same time, Hawaii only has 10 percent of its original forests left. Calhoun travels to the Big Island to buy his koa from one of the sawyers who usually sets aside nice curly lumber for the small group of furniture makers who live in the islands. 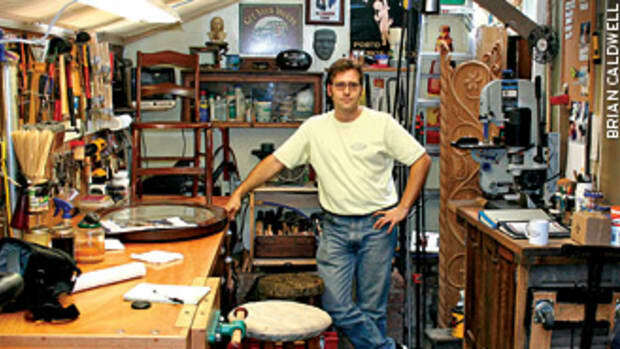 Through the years, mostly by trial and error, Calhoun has become an inlay specialist. 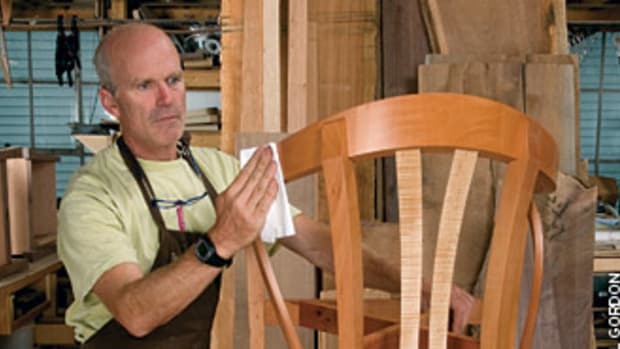 He often uses the technique to create the appearance of movement within his furniture. 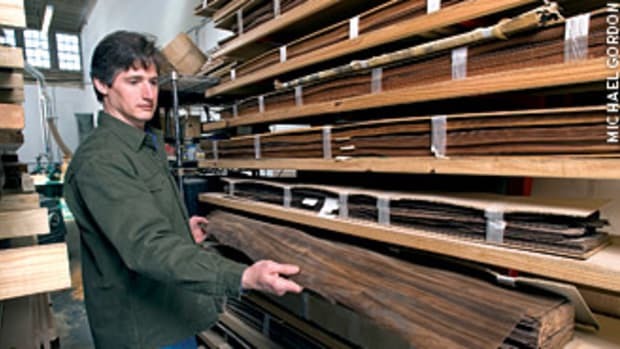 Most of Calhoun’s pieces are made with solid wood, and he believes most people still have the perception that veneer is cheap. 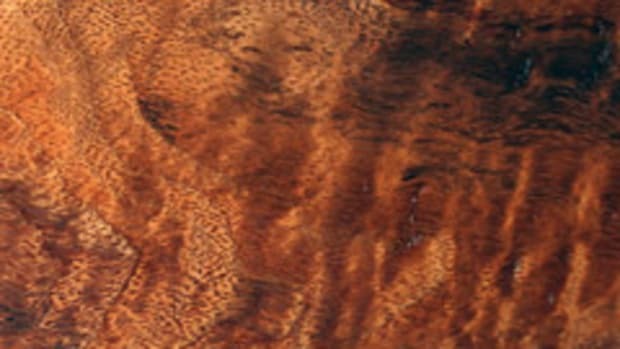 They don’t understand the history of marquetry and bookmatching, and fail to see what is involved with making a complicated veneer piece such as a piecrust table. 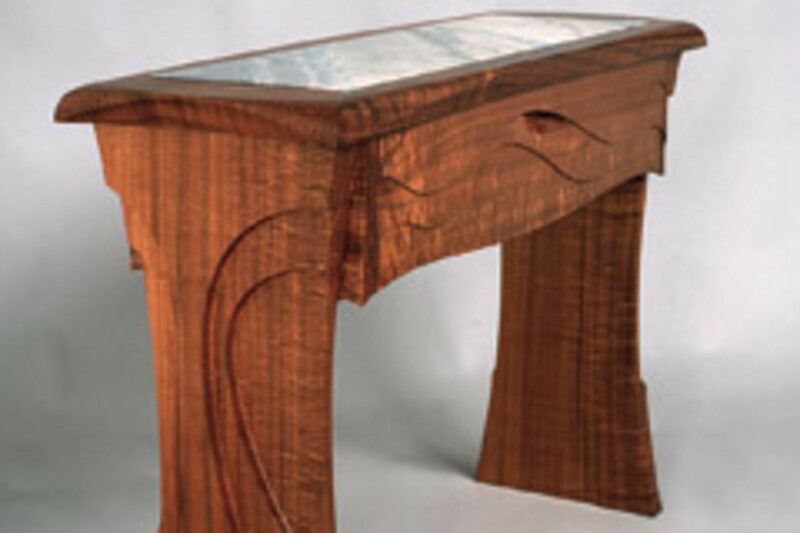 Along with his talent for inlay, the Maui furniture maker has become a talented carver. Calhoun’s stand-alone shop is a mere 300 sq. ft., and one side is a tarp that he throws up on the roof in the morning to let the air in. He closes his open-air shop in the afternoon, pulling the tarp down to keep the sun out and the temperature down. Like many, Calhoun would love to do most of his work with hand tools, but he is astute enough to realize time is money. 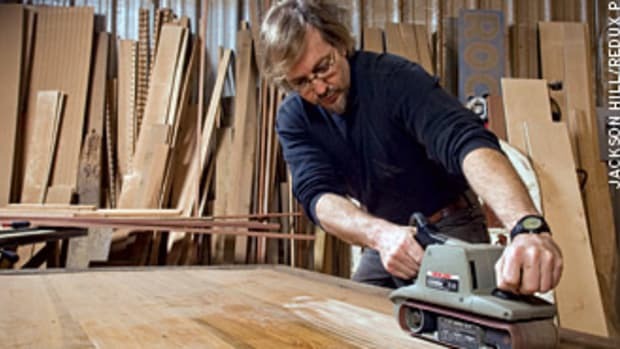 His main machines include a Laguna 18" band saw with a Leeson variable-speed drive, General 350 table saw with an Excalibur fence system, Grizzly 20" planer, Powermatic 719 mortiser, Record/Crown 8&apos; lathe, and Sharp conversion spray gun. On occasion, Calhoun receives a call from a contractor offering him a finish carpentry job at a mansion under construction. The money is too good to pass up, and Calhoun stops his furniture making for a few weeks. The work is long and monotonous but, in the end, it pays the bills and provides him more freedom once he returns to his shop. But how does he balance the trim work with his furniture making and deadlines? Although the group of about 50 woodworkers would like to put on an annual show, securing a venue on Maui is nearly impossible. The hotels are involved with convention work and have little time to deal with a small custom-furniture show. Calhoun’s involvement in Hawaiian culture also led to a major role in the restoration of “Mo’olele,” Maui’s 43&apos; double-hull Hawaiian sailing canoe, during the mid 1990s. He found someone to fund the project and worked one or two days a week on the canoe, finding it to be interesting and a great learning process. Unfortunately, much of his hard work has gone for naught. Calhoun has never had an employee or an apprentice, and it’s unlikely that will ever change. 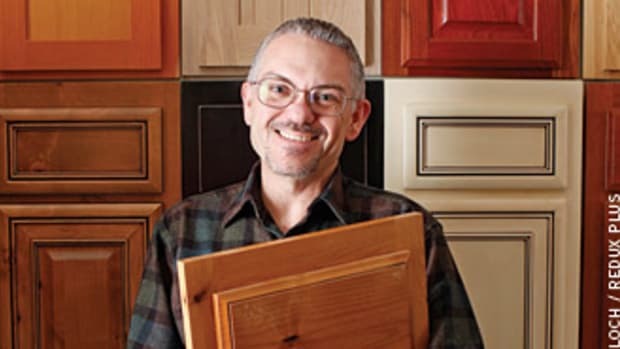 He’s had business offers from different people to get involved with flooring, ceramic tile, and running a cabinet shop. But, in the end, he simply wants to work for himself. Calhoun built this Chinese dining set with solid kamani wood. All of the joinery is done in the Chinese style; no glue, just wooden pins that lock the joints tight. The table measures 95" x 40" x 29" and when a table is more than 6&apos; long, the usual Chinese style is to add a center pair of legs, which the client did not want. The solution was to build box beams with internal blocking as the “aprons” (all dovetailed together), and an additional center box beam down the length of the table. The joints where the legs meet the aprons are each comprised of 11 pieces of wood with a single bronze pin that locks it all together. It took Calhoun 10 months to build and finish the table and chairs. He continues to be involved and very concerned about the preservation of Hawaiian plants and trees that contribute to the islands’ unique culture. As he sits at a table in his living room, looking down upon a gorgeous valley that spills into the Pacific Ocean, it’s not difficult to see where Calhoun gets his inspiration. He has a stack about 2” thick of projects and sketches of things he admits he’ll probably never make, but he’ll continue to look out the window and sketch. And if the Maui furniture maker has his way, he’ll continue to exhibit that inspiration and his love of the Hawaiian culture by telling its story in his furniture. One gets the feeling Calhoun has many more stories to tell.